She Writes Press, 9781938314681, 200pp. 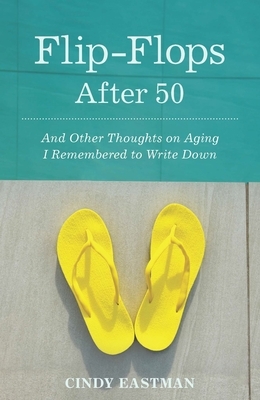 Flip-flops After 50 will amuse, enlighten, and provoke readers to think about the topics that affect all of us. Who hasn't dealt with the emotions from family events, stress from lousy jobs, or the bittersweet feelings when the kids leave home? Not to mention body image, high school reunions, and parenting. Eastman's conversational style and easy humor tackle the sublime and the ridiculous, the sacred and the profane. After a certain age--and it's no secret that it's 50--Eastman argues that attitudes change for the better. Making decisions gets easier, although there's no guarantee that life does. Even so, her writing allows us to take a look at our own issues with the reassuring handholding of a confidante. Cindy Eastman's work is informed by her ability to be an observer as well as a participant in her life. With her dry sense of humor, she is able to address a variety of topical subjects and deliver an insightful analysis that's both provocative and amusing. Currently she coordinates a supervised visitation service with her husband in his counseling practice and facilitates diversity and anti-bullying trainings for the Anti-Defamation League. She also teaches a writing course for the Osher Lifelong Learning Institute at the Waterbury campus of UConn. Eastman makes her home in Connecticut with her husband, Angelo, and their cat. She is working on a second book when not babysitting her grandson.